I don’t know how it is in your town but, here in Naples and the surrounding area, the amount of self-serve froyo locations to pop up is astounding. It seems like there is a new location on a monthly basis…it is really quite hard to believe. I have visited quite a few of these locations and while they are okay, they are really nothing that amazing. While not expensive, they are also not cheap and in the end, its simply frozen yogurt with a bunch of toppings. Whop-di-do. No big deal really. The newest self-serve froyo to pop up was Menchie’s. This is a chain that I had heard of prior to its opening. Located only about 5 minutes from my house, I was intrigued. Menchie’s was probably open for about a month before the first time I tried it. The first time I tried it, I did not have my camera so we won’t even discuss that. But, Menchie’s had two things they offered that were sure to bring me back – Hot Fudge and Hot Peanut Butter. Hot Fudge & Hot Peanut Butter are two items that I love. You have heard me blab on and on about them so I will spare you from that. Add these two to ice cream, or in this case froyo, and oh my I’m in love. A few weekends back, I decided to bring Mommy to Menchie’s since she loves Hot Peanut Butter almost as much as I. And this time, I remembered to bring my camera. 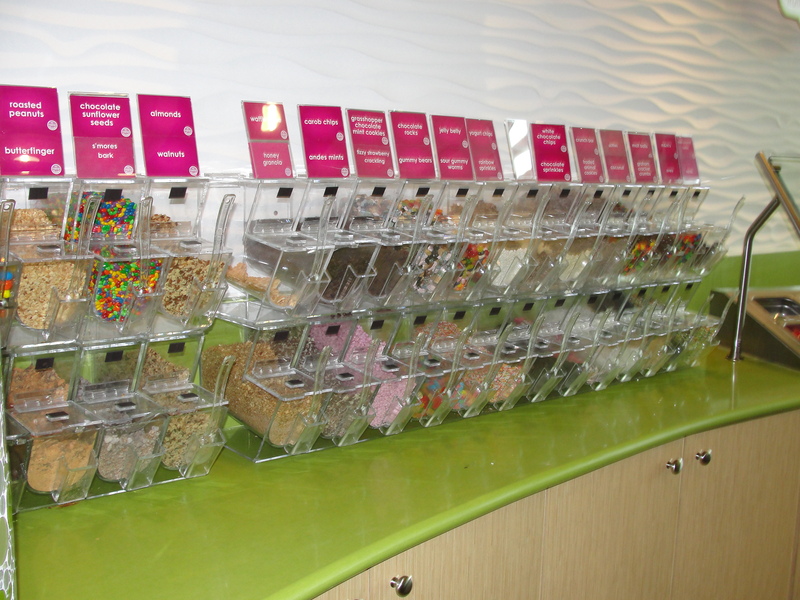 Menchie’s is your typical self-serve froyo location. A variety of changing flavors of froyo and a bar worth of toppings – dry, fruit and hot. On this occasion, I tried a few options of froyo before deciding on which to fill my bowl with. You can fill your bowl up with as much as you possibly want. Then, they weigh your bowl, charge you a cup fee plus per ounce and give you a spoon. Trying the froyo before deciding on what you want to spend on is certainly a plus. On this occasion, I opted for some Peanut Butter, Cookies and Cream and a touch of Mint Chocolate Chip Froyo. The biggest beef I have with froyo is the lack of flavor it has. While the consistency of Menchie’s is great, the flavor is lacking. The consistency is extremely smooth and ice-crystal free. Perfect consistency which I do really enjoy. The flavors aren’t bad, they are just very subtle. I could taste just a hint of peanut butter, the cookies and cream tasted like a bland chocolate and the mint chocolate chip tasted like bland chocolate/light mint. Even though the flavors aren’t off the wall, I do not fully mind. The muted flavors allow the toppings to be even better. I decided to really go to town with my toppings. I mean, why not. I added a large amount of chocolate-peanut butter candies, waffle cone pieces & Oreo’s along with obscene amounts of hot peanut butter and hot fudge. Ohh my. I was so excited to eat this marvelous creation. The chocolate-peanut butter candies are pretty good. A small core of peanut butter is located within a hard chocolate shell. These could only be better if they were more buckeye-esq. The Oreo’s are just regular Oreo’s that are crushed – you can’t mess these up. The waffle cone pieces are okay but really not great. They are just fine. 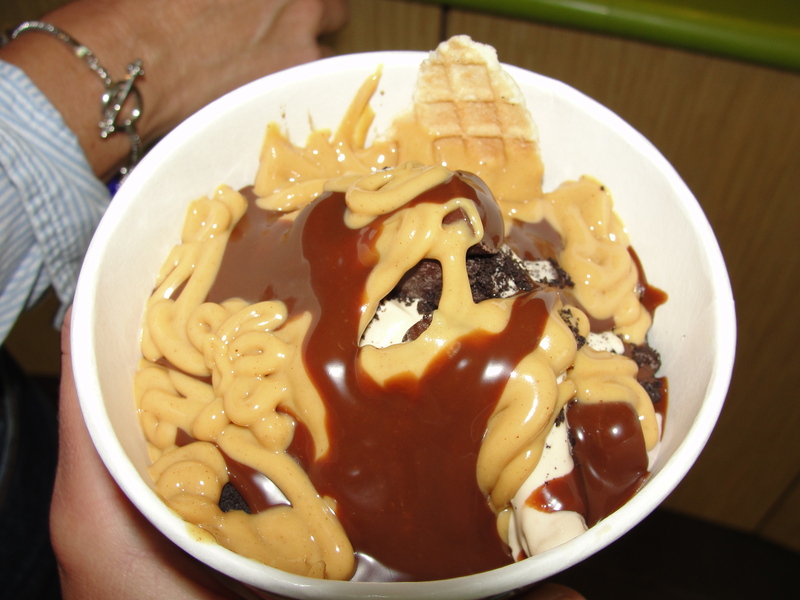 The star toppings that make Menchie’s my new go to froyo, are the Hot Peanut Butter and the Hot Fudge. The hot peanut butter is smooth and bursting with flavor. This peanut butter tastes like real peanut butter and there is no overly sugar taste or after-taste. Every bite of it blends perfectly with the froyo and is just so smooth. 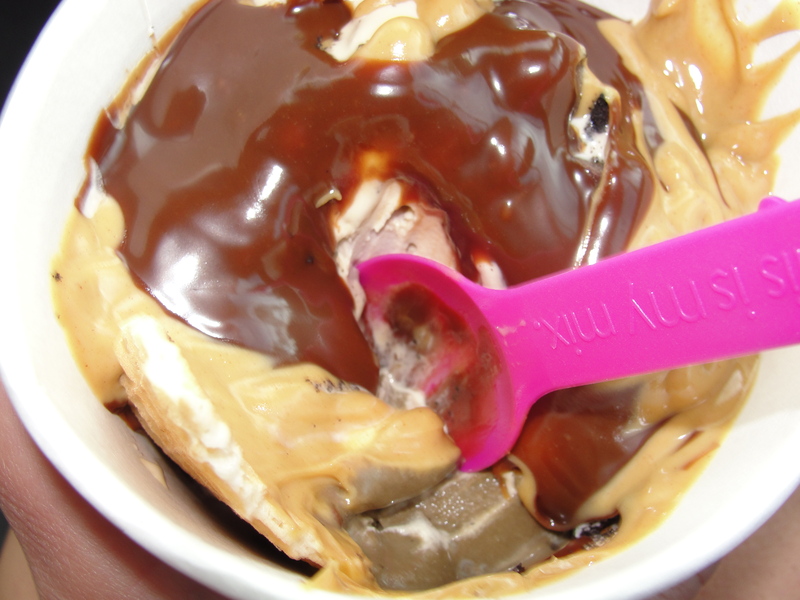 Even with the cold temperature of the froyo, the hot peanut butter stays warm & smooth for almost the entire eating time. Plus, the peanut butter is nice and thick – not runny at all. The hot fudge, while not the best hot fudge I have ever had, is quite lovely. The fudge taste is noticeable and this is certainly hot fudge and not chocolate sauce. The hot fudge is very, very thick which I love. The fudge taste isn’t super strong or chocolaty but, mixed with the hot peanut butter, the flavor is just right. The combination of hot peanut butter and hot fudge, forms a beautiful mixture above and with each and every bite of the froyo. There is a definite division between ice cream and froyo. I like both but I like froyo even more when it includes Hot Peanut Butter and Hot Fudge. 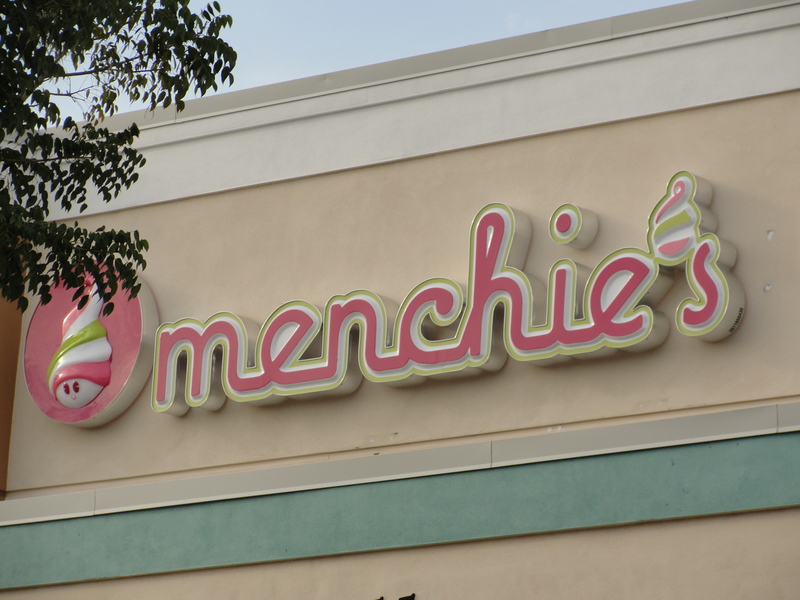 Menchie’s is a great addition to the oversaturated self-serve froyo of Naples and the surrounding areas. 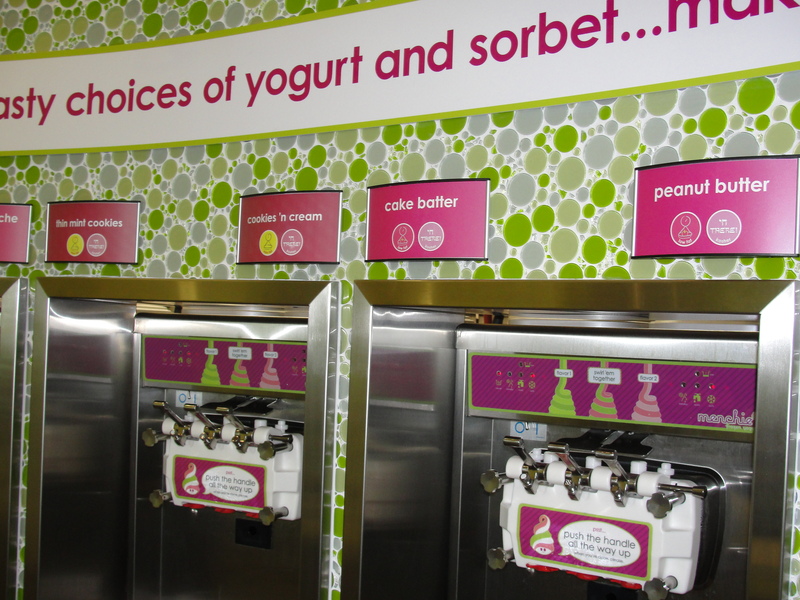 Aside from the toppings and smooth froyo, the service is excellent and they offer a rewards points program. While Menchie’s will never be my beloved No Way Jose, I am happy with it being my one and only Froyo Loveyo.